The agreement, which was signed between Fives North American Combustion Spain, S.L. 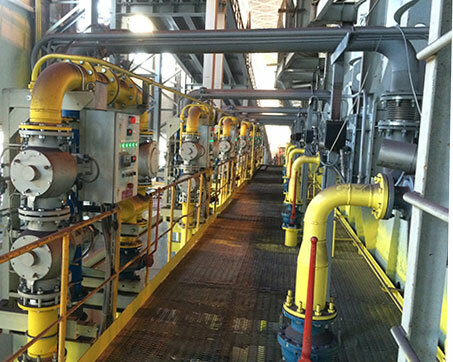 and Russia’s heavy machine building company Uralmashplant - one of the subcontractors of the new pelletizing plant, included 12 customized high-performance burners with the total connected input of 90MW. The burners, designed to produce 1,200-1,300°C heated air, are installed into the induration furnace at Mikhailovsky GOK’s pelletizing plant. In addition to the burners, the complete system included fully instrumented flow controls for both fuel and primary air. Fives also rendered site services in the form of process expertise, installation supervision, commissioning support and training. The new plant, which will enable Metalloinvest to increase pellet production capacity by 5 million tons per year, was successfully put into operation on September 25, 2015 in the presence of top Russian government officials. A world leader in value-added heating technologies, Fives has supplied combustion solutions for pelletizing plants for more than 50 years. Fives collaborates with pellet line builders and producers on innovative solutions that achieve ultra-low NOx emission and optimum fuel consumption.